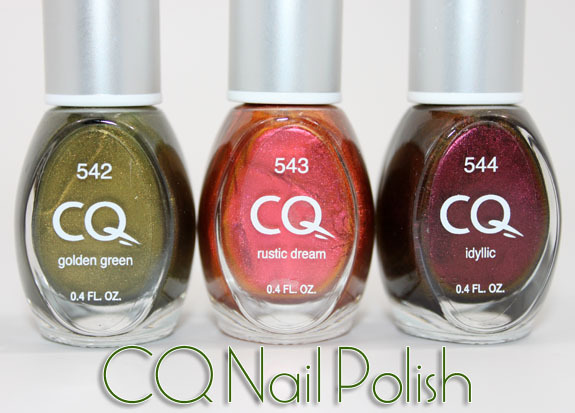 Ever heard of CQ nail polish? I hadn’t until not too long ago when I was at Rite Aid and saw a little display with these little guys sitting quietly and prettily on it. 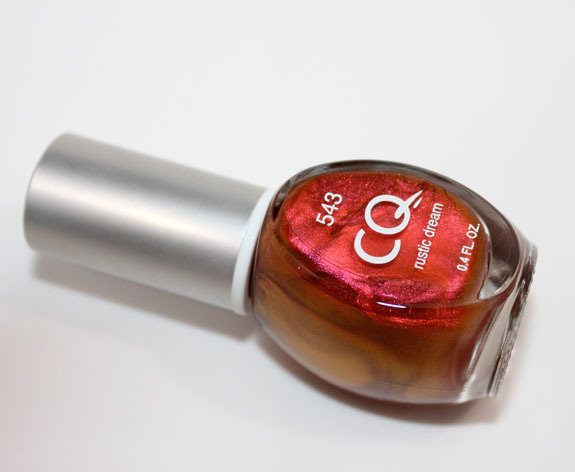 CQ Cosmetics is a brand that focuses on delivering quality nail polish and other cosmetics at affordable prices. They also put out the drugstore nail brands Chameleon and Petites. These are small little bottles, but boy do they pack a color punch! These three were really saturated and has a great glow about them. All of these were just two coats. 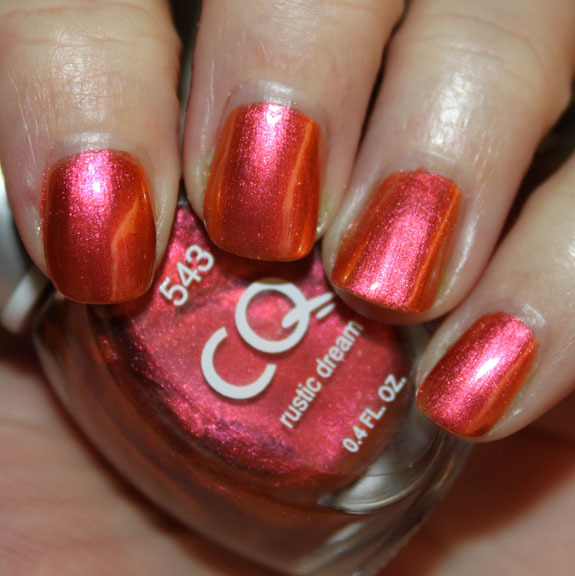 Rustic Dream is a pink/orange duochrome color. The base is pink and then depending on the way you move your hand you see flashes of orange throughout. It’s not a super duper heavy duochrome, rather more subtle. 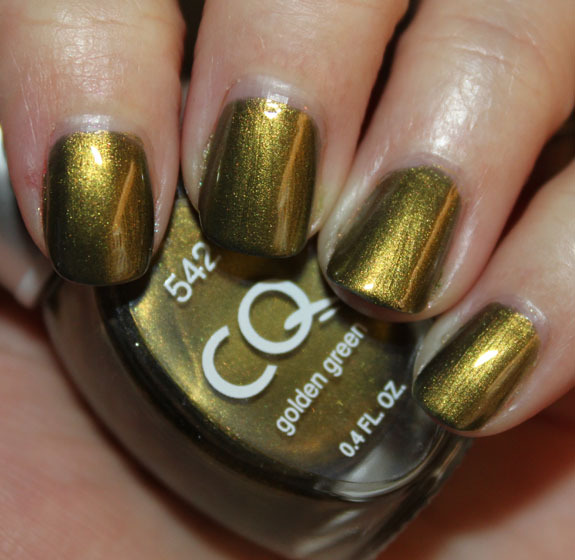 Golden Green is an amazing deep olive green with heavy yellow shimmer. This one glows and it’s just really hard to take your eyes off of. A great addition to my ever-growing olive green collection. Idyllic is s warm purple/red duochrome. Again this one is more subtle, but the duochrome effect is there. I love how it’s not red, not purple, just this interesting shimmery berry type color. I have yet to do a wear test with these, but as you know, I normally change out polish within 2 days anyway so wear isn’t as important to me as color and application. For inexpensive little polishes from the drugstore I am impressed with these for sure! I love Golden Green, I’m going to need to keep an eye out for that one at my local Rite Aid! Wow, I like Rustic Dream! I’ve not seen that brand here in the UK yet, although it’s possible they do sell it somewhere here. Cute! I was actually curious about these since I too had seem them at Rite Aid. Ugh, I don’t have a Rite Aid within several days drive of me and these aren’t at any of my local Walmarts. I hate when you fall in love with something and you have no way of getting it. Oh well, I’ll just tell myself I don’t NEED any more nail polish. 🙁 Great swatches as always Kelly! I’ve purchased some of these and love them. I want the Golden Green – so gorg! But I think my Walmart have stopped carrying CQ – I’m hoping it that they are just changing the display because I haven’t seen them in about three months. Those are awesome – I might have to try all 3! These are fabulous! What would it take to make these polish come up to Canada!? Thanks for sharing! I would also be interested in these polishes if they were available in Canada! Great colours for an affordable price? I’m so there. Rustic Dream reminds me of Zoya’s Tiffany. <3 May totally lemming the green one! Sara´s last post…Saras got some- EASTER CLOWN DRAMA! They’re all gorgeous, right up my alley. I need the green. I have a couple of polishes from this brand and I am pretty happy with them. marisol´s last post…Live shows galore! I just saw these at my RiteAid. I hovered for a moment, but decided to pass on them. They are gorgeous, I’m just tired of dark and vampy at the moment. Seeing these swatches is giving me non-buyers remorse. All three of those are pretty. I really love Golden Green, but I saw Rustic Dream on another blog the other day and felt very “meh” about it. After seeing your swatches, my feelings haven’t changed. It just feels like Bad Fairy’s boring cousin to me. Maybe I’d have to see it in person. Oh how lovely… I’ll have to give them a try 🙂 Always love seeing your reviews before buying a new product! Gee, there’s some SERIOUS color in those little bottles. These are all gorgeous. A bit more fall than spring. I will keep my eye out for them! 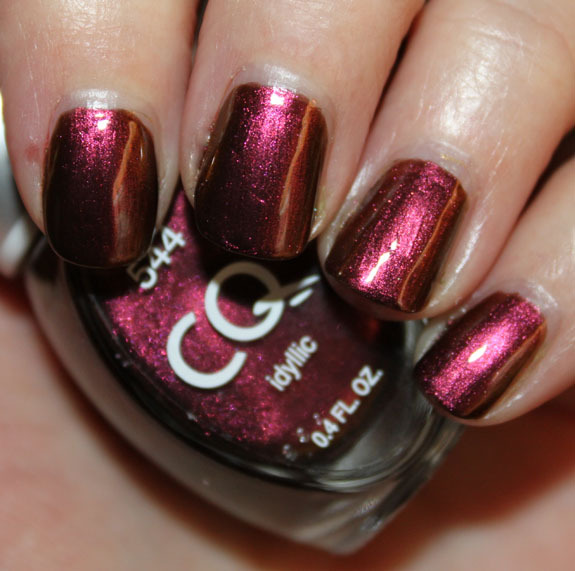 I have a few colors from CQ and I really like them. They may only be available at Rite Aid now however. A lot of Walmarts clearanced out the line a few months ago. I was hoping Rustic Dream would be a Bad Fairy close-enough dupe kinda thing, but I don’t really see it. But I’ll have to check out the CQ display next time I’m at my Walmart, they usually only have kind of boring colors. 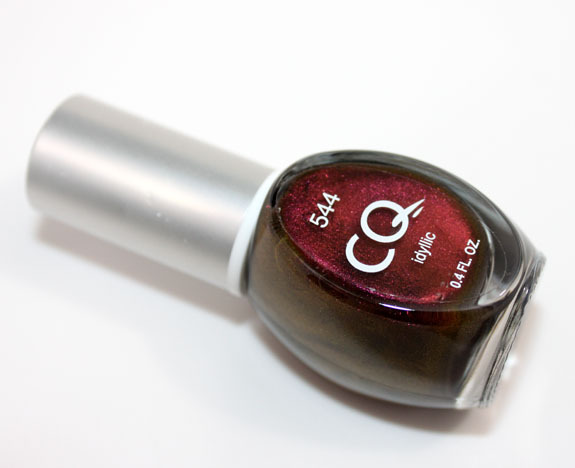 Allison´s last post…MASSIVE giveaway at Nail Fanatic! I like the Golden Green the best, but I like them all. There’s a very glowy quality about all three. These are some cute polishes. Love the duochromes. I bought the Mystical one. It’s a real pretty shiny purplish sort of fuscia color. I’m going to have to look for these colors.